RJC Yacht Sales & Charter announces the sale of 115' Broward, MUCHOS MAS! RJC Yachts Sales is very pleased to announce yet another 'in-house' sale this week on the 115' 1994 Broward Motoryacht, MUCHOS MAS!! David Wiest of RJC Yachts represented the buyer and Bob Cury was the listing agent. 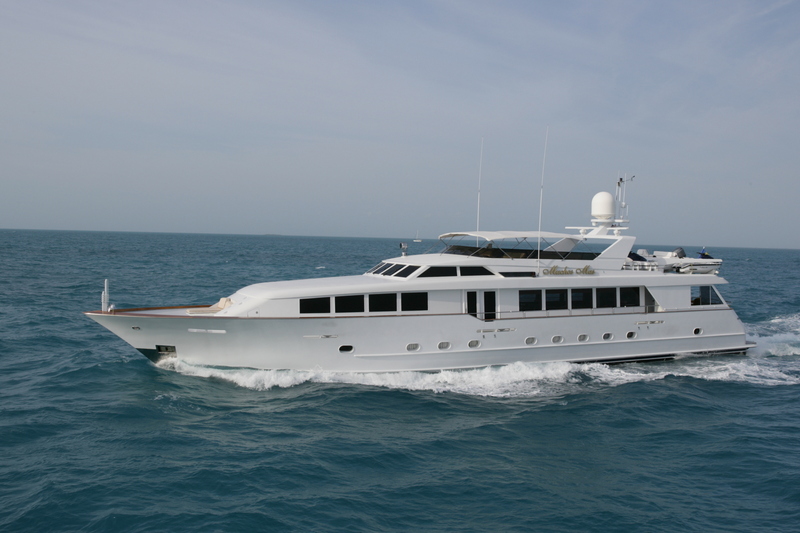 Built in aluminum by US yard Broward Marine the 35 meter Muchos Mas was delivered in 1994 as a raised pilothouse model. Accommodation is for up to nine guests in four staterooms. The master suite is located amidships and features a his & hers marble bathroom, while there is a VIP stateroom forward with a queen sized bed, plus a double and a twin aft with a Pullman berth, each with en suite bathroom facilities and full entertainment systems. The large saloon has an L-shaped sofa, occasional seating and a cocktail table, an onyx-topped wet bar with a fridge, ice maker and three bar stools. A 50 inch HD television set and entertainment system lies between the relaxation area and a formal dining room with seating for eight guests. Outdoors, the focus of attention is the expansive flybridge with triple helm bench seating, a U-shaped settee, wet bar, fridge, barbecue grill and a Bimini top - the perfect setting for al fresco cocktails and meals. Twin 1,650hp Caterpillar engines give her a cruising speed of 17 knots. Her asking price was 2,995,000. The new name of the vessel will be ACQUA and will be available for charter in the Florida/Bahamas.